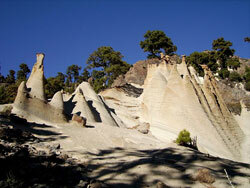 The Canadas del Teide make people think first of all of one of its most bizarre rocks. Depicted are the Roques de Garcia with several hiking routes. 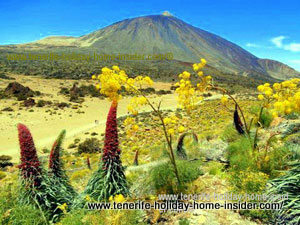 Mount Teide is usually also most prominent in its neighborhood, as in the beautiful picture above. Free parking and the Parador Restaurant for refreshments are nearby. By the way, there is also a Titsa public bus stop. The Canadas (spelled Cañadas in Spanish) form sunken craters. They have their own sun, wind, cloud and weather rules and consequent flora. This enormous open space with a diameter of 10-16km and a circumference of 45 km plays a role. Indeed, this is all part of the exceptional, fortunate Elysian world that was already known to Homer, to Plutarch of ancient Greece and to elite Egyptians. Not only Colombo used the high altitude trade winds which render a breeze to the warm Canadas. They helped the explorer to get via the Tenerife Island Gomera to America. The Portuguese 'sailed before the wind' with those Northeasterlies for trading. Those fast moving clouds that often form strange formation above Teide are much drier and lighter. They prevent further rising of the heavier, denser Elysian winds by the latest at 1600m at the edges of the Cañadas crater. The scientific principle, why Elysians don't get into the higher regions of the Teide National Park is called convection. Romance in the Canadas del Teide? An ocean of clouds by way of Elysian winds is rather common during a romantic Tenerife sundown in the National Park in the Canadas, as depicted above. How cold do the Canadas get at night? No, they are not like the Sahara desert where temperatures drop as low as cold 5 degrees C during the night, unless in winter. Indeed, temperatures by the volcano's peak may easy go as low as 15 Degrees Celsius during the coldest months. That may even be as late as by the end of February. This happened in 2016. Then you could see a very white Teide Volcano, as depicted below. 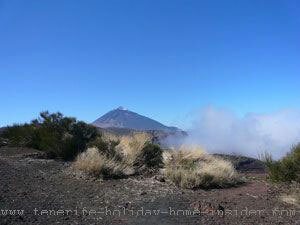 Besides, 30 degrees Celsius in summer during the day are hardly unpleasant by Teide because of the trade wind breeze. By the Teide Telerifico the cable care station 800m below the world's 3rd tallest volcano is a backpacker cabin for resting and staying the night. There is a good reason for it, as is explained, just now. The purity of the air near the Teide top is generally little affected by the dormant volcano. However some gases, such as sulfur always escape, but don't change the climate. A temperamental awakening of the active giant with the rumbling tummy deep down would be a different story. Ultra violet rays would still penetrate everything, though. Obviously, the higher you climb there, the thinner the air. Your health may become an issue at the Telerifico or by the latest at the highest point of the Canadas at the Teide summit of 12198 feet. By the way, the 2018 alarms by the British Tabloids of a Mount Teide eruption were not scientifically justified. There was much seismic activitity which was seen as normal by the experts, as it was too deep below the ocean. The Elysian winds which cause grey and later white clouds which are called bad, whet weather by people in South Tenerife bring pleasant temperatures. They are a blessing and don't really stay on the Tenerife North coast, as they climb and settle on mountain slopes from 400m height onward. They reach between 1200m and 1600m above sea level. They enter the ground as high as the borders of the Teide Canadas highlands and provide water for a whole island, not just for parts of the outskirts of its National Park. In fact, the huge mass of white water vapor which seems to stop suddenly by the blue skies of the Canadas del Teide, looks rather odd. Canadas with Sauna tropical rain forest? The Canadas del Teide would be a tropical rain forest, as you may know from the movie 'Gorillas in the mist'. They would have a sauna climate if the trade winds didn't practically sit themselves onto the thick clouds caused by Elysians and stopped them to rise. Noon times in the mountains, such as higher levels of the Cañadas are best used for rest, as the sun may be very hot. Also beware that even lower land than the 3718m high Teide isn't immune to big, sudden climate changes in winter. Temperatures can drop from 30 degrees Celsius to freezing conditions between November and April. Drench thirst or find best refuge in the Canadas del Teide? There is a visible Bar by the well designed mountain road the Cordilera del Teide. 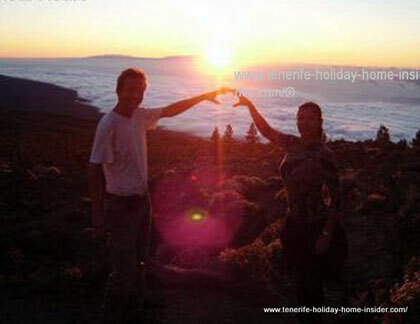 There is also 'El Parador del Teide' which is the only hotel in the whole Tenerife National Park. It's not cheap, nor is its restaurant which is open to everybody but its Teide hotel standard is good and its park location is unbeatable. and where healthy bees love to do their work to help nature. Expats who paid their early year dues to the big volcano district raved about the masses and sizes of red Tajinastes in 2014. These Echium Wildpretii often surpassed a height of well over 2 meters or 7 foot. How did the hikers find them? They walked from the Canadas del Teide Portillo Visitors Center here towards the Teide Fortaleza. Discover some unusual photos with a snow capped Teide of Canadas at Puerto de la Cruz in this context.. Helpful Webcam about the Canadas del Teide at the astronomy station. That is the Izaña weather station. Unfortunately, I cannot connect now to show you more. As the Cañadas del Teide can be accessed from Izaña within a few minutes I wouldn't chance it to go there on a cloudy day. All Teide mountain roads may be closed during extremely high snow fall. This is taken into consideration by organized astronomy-watch tours. 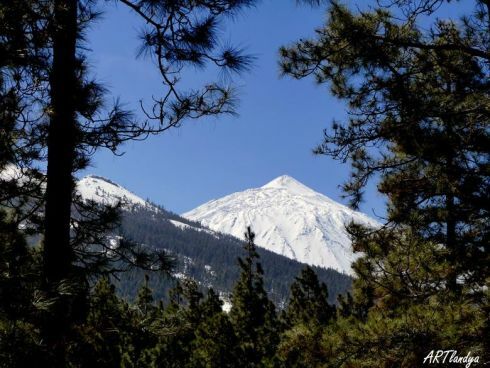 The safest and most pleasant way to experience the climate by the Teide crater called Cañadas for the first time is to do a trip along its 25 km Cordillera mountain roads with a tour bus or with a rented car. Tour operators are familiar with the Cañadas. They may foresee bad weather and may postpone a trip..
Later, try 'do it yourself' Canadas excursions to Spain's highest peak with tips on road tracks in summer, spring or, early autumn, provided you have the time. A rented car helps very much with last minute route changes because of inconvenient weather. However generally, the climate of the Cañadas del Teide hardly ever lets you down. Escape into a protected land of rocks, lava, sand and unsurpassed beauty. There, the Tenerife sun and clouds may produce wonders. Canary pines grow within the most narrow creeks. Miniature plant wonders shelter lizards and butterflies. Watch, eagles, owls, hawks, you name them... All those birds of prey love the skies by Mount Teide. Keep a look out for falcons, such as the Barbary falcon of the Canadas del Teide. This is now one of ecologically threatened birds like almost all falcons, as they may attract passionate human hunters. a sometimes endless seeming chain of mountains bathed in sun light or even in snow. Elysians were not only mentioned by Plutarch which I discovered in the Internet but also by 'Os Eliades' which I read in Portuguese, a long time ago. Please, return from Canadas del Teide to the biggest of all Canary Islands where everybody with a rented or own holiday home in Tenerife loves this region of Spain by its highest peak. 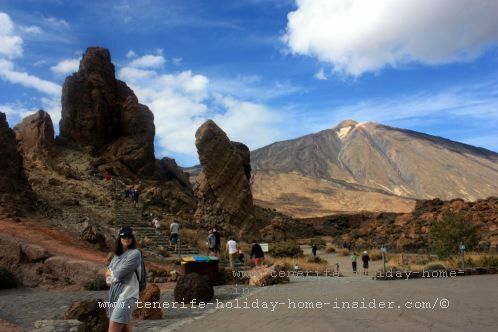 Info about the geological background of Tenerife Teide, its two half craters the Canadas and its island here.